November 17, Washington, DC – The University of the District of Columbia (UDC) is pleased to announce that Ms. Allison Mulligan will serve as the volunteer coordinator for the “Training & Serving the ‘Whole Veteran’ Initiative,” which will be directed by the Office of Military and Veteran Student Services (OMVSS), under the Office of Student Development & Success (OSDS). This project is the result of an ongoing partnership between UDC and the Maryland-DC Campus Compact (MDCCC) AmeriCorps VISTA program; the prior initiative was focused on financial literacy. Ms. Mulligan, coincidentally a UDC student, will help Ms. Sequoyah Adebayo, Director of the OVA, and Dr. William Latham, Chief of OSDS, continue the development and implementation of the initiative, with the primary goal of building a strong and sustainable culture of care and support for military and veteran students who already or may eventually attend the University of the District of Columbia. The project will conduct outreach to veteran students and veterans in the community at large to help inform and build a network of responsive training, services and supports that strengthen the recruitment, persistence and graduation of veterans. 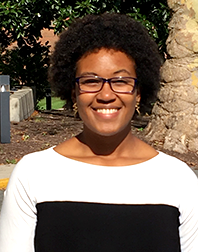 Allison Mulligan, from Dayton, Ohio, is a sophomore in the Nutrition and Dietetics program, in UDC’s College of Agriculture, Urban Sustainability, and Environmental Sciences (CAUSES). She served four years in the U.S. Navy as a rated Boatswain’s Mate onboard the USS Pearl Harbor (LSD-52) and the USS Decatur (DDG-73), both based in San Diego, California. While on active duty, she deployed three times, conducting counter-piracy operations, disaster relief, and humanitarian assistance. After being honorably discharged from the Navy, Allison enrolled in culinary school at the Art Institute of California, San Diego, with a focus on Baking and Pastry. After receiving her associate’s degree, she made the move back east to expand her horizons in agriculture and nutrition. Looking for a way to jump into her new endeavors, she participated in the Veteran Farmer Reserve Program at Arcadia Center for Sustainable Food and Agriculture, where she gained knowledge and trained to start a business in agriculture. She still supports this program by cooking for the new class of Veteran Farmers every month. While enrolled full-time at the University, she is chapter president for MANRRS (Minorities in Agriculture, Natural Resources, and Related Science). Off-campus, she is serving her community as a Platoon Leader through The Mission Continues, a national, nonprofit organization that empowers veterans to serve in their communities through mission-focused service and support projects. Having recently taken on the role of Platoon Leader, Allison’s mission is youth health and wellness. For more information, please contact: Sequoyah Adebayo, Director, Office of Military and Veteran Student Services (OMVSS), UDC, sequoyah.adebayo@udc.edu or 202.274.6221.